Theodore T. Jones, Associate Judge of the Court of Appeals, was born in Brooklyn and attended public schools in New York City. He graduated from Hampton University in Hampton, Virginia in 1965, receiving a Bachelor of Arts degree in History and Political Science. Judge Jones served on active duty with the United States Army from 1967-1969. While in the service, he was stationed in the Republic of Vietnam, and attained the rank of Captain. He graduated from St. Johns University School of Law in 1972. Judge Jones is admitted to practice in New York State, Federal District Court (E.D.N.Y, S.D.N.Y. ), United States Tax Court, Federal Court of Appeals for the Second Circuit, and the Supreme Court of the United States. The Judge has been married to the former Joan Sarah Hogans for more than forty years, with two children: Wesley Jones (a Software Engineer) and Theodore T. Jones, III, Esq. 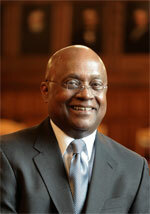 Judge Jones was elected to Supreme Court with a term beginning 1990. In January 2007, Justice Jones was nominated by newly-elected Governor Eliot Spitzer to the New York State Court of Appeals. After Senate confirmation in February, he was sworn in as an Associate Judge of the Court. Judge Jones is currently a member of the Board of Trustees of St. Johns University, the Board of Directors of St. Johns University School of Law, and the Board of Directors of Judicial Friends, the co-chair of the Justice Task Force, and the chairman of the Diversity Committee of the Court of Appeals. He previously served as a member of the Committee on Character and Fitness for the Appellate Division Second Department.